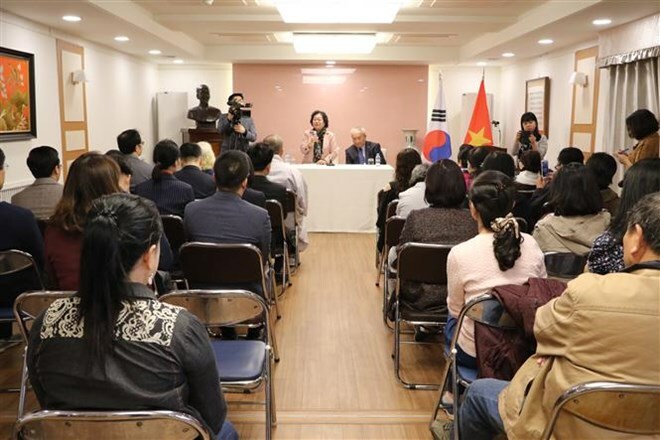 Seoul (VNA) – A delegation of the Vu A Dinh scholarship fund, led by the fund’s Chairwoman and former Vice President of Vietnam Truong My Hoa, paid a visit to the Embassy of Vietnam in the Republic of Korea (RoK) on April 5. At the meeting, Vietnamese Ambassador Nguyen Vu Tu briefed his guests on the sound relations between Vietnam and the RoK since the two nations first set up diplomatic ties in 1992. For her part, Hoa, also Chairwoman of the “For Beloved Hoang Sa, Truong Sa” club, said the Vu A Dinh scholarship fund was set up to support disadvantaged students in island areas and ethnic groups, considering the importance of facilitating children’s studies, especially for those who reside in remote and mountainous regions. Since the fund’s establishment in March 1999, it has presented 5,000 scholarships each year to children living in mountainous and island areas, she noted. She took the occasion to hand over membership cards to three new members of the “For Beloved Hoang Sa, Truong Sa” club, raising the club’s membership in the RoK to 17 out of the total 90 overseas members.